Opalescence Tooth Whitening Systems - Which Treatment is Right for Me? Want to whiten your smile? Find out which award-winning Opalescence whitening product is best suited for you! Do you already have a whitening tray? How much do you think is a reasonable amount to spend on a professional, dentist-dispensed whitening treatment? Which time frame/cost scenario appeals most to you? Do you have preexisting sensitivity issues, or have you ever experienced sensitivity from a whitening treatment before? With a complete line of professional products that deliver professional results, Opalescence caters to your lifestyle. Whether you prefer to whiten overnight in the comfort of a custom tray, brighten your smile while you're on the go, or get immediate results with an in-office treatment, Opalescence can help! Learn about the complete line of Opalescence products here and talk to your dentist to learn how you can begin whitening with Opalescence today! 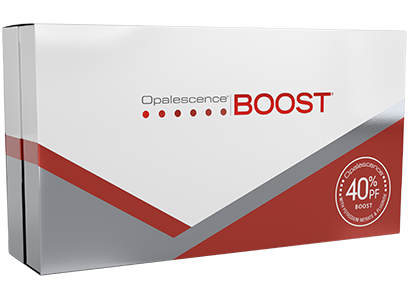 Dispensed only by a licensed dental professional, Opalescence Go whitening comes in prefilled, disposable trays, so it's easy to take with you anywhere you go. 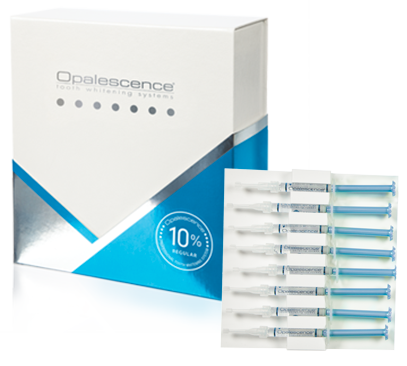 Opalescence Go offers a whiter smile in just 5–10 days with wear times ranging from 15–60 minutes per day. And its two delicious flavors make this professional alternative to over-the-counter tooth whitening taste great too! A 40% hydrogen peroxide power bleaching gel, Opalescence Boost whitening offers brighter, whiter teeth after about an hour in the dental chair. This professional treatment is administered start to finish in the dental chair, so talk to your dentist to set up your appointment! To maintain your bright, white smile, use Opalescence toothbrushes and specially formulated whitening toothpastes. You'll get enhanced stain-fighting power and a maximum dose of fluoride to keep your smile bright and healthy.